Mashiro would rather die than give up on his dream. Shounen powers ACTIVATE! 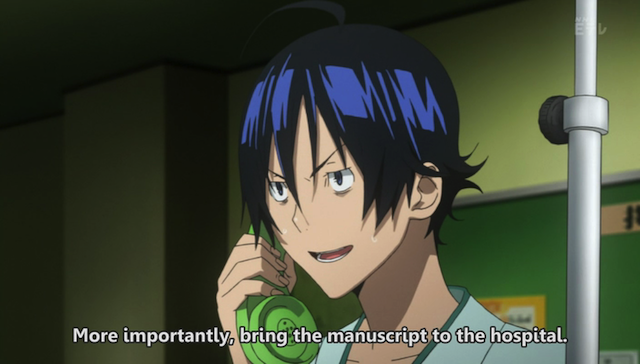 Episode 6 of Bakuman’s second season brings us perhaps the most shounen episode of this franchise yet. Mashiro has collapsed from the strain, and for some reason the quack doctor thinks removing part of his liver will help. 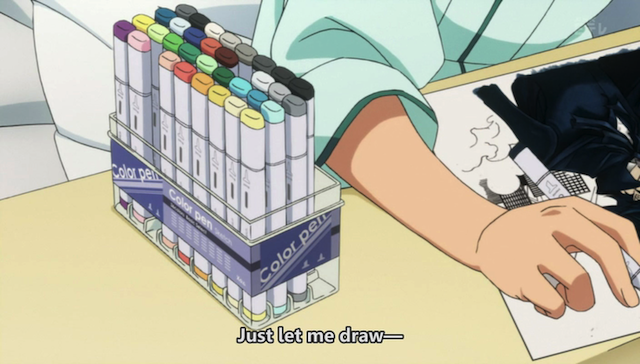 Mashiro refuses to stop drawing, however. Even if it kills him, even if he loses the love of his life, he will continue to draw manga. In particular he is working on a color spread, which gives us another chance to check out his art tools — this time some nice color markers. Mashiro uses some fine color markers. Mashiro uses Copic Sketch markers. These are very nice color markers that have two tips: one is thin, for detail work, and the other is a broad, chiseled tip, for filling. Mashiro is very happy that he has such nice markers. 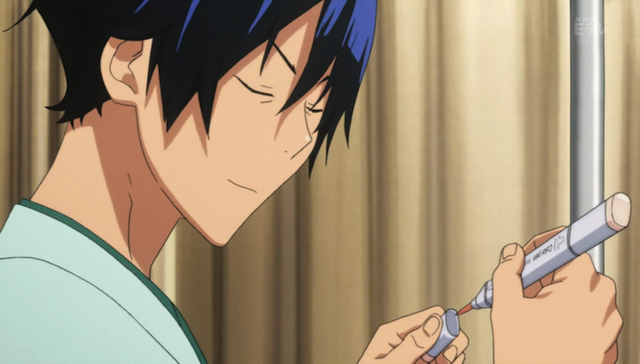 Here we can see Mashiro uncapping the thin-tip side, also known as the brush side. This side has a nib that is not just thin, but long and flexible, like a brush, which gives its user the ability to dynamically control the width of the stroke. it allows for more painterly applications. So, is Mashiro going to live? Who cares when you have such nice Art materials, right? 😀 Well, Mashiro wasn’t looking too good in the closing minutes of this episode. If he does die, he can leave the markers to me!